Do you want to have solid nutrition from fruits and vegetables? A cup of healthy smoothie is the thing you must try from today. Making this delicious, healthy and refreshing liquid involves a smoothie maker, that’s a dream machine for health-conscious people. Buying a quality blender is a challenge. You can experience odd situations while making your favorite smoothie without the right tool. Thousands of blenders are available in the market, and each blender is different from another. For picking high-end blenders, we believe in quality. A high-quality blender is more than a smoothie maker. Keep reading for uncovering the best smoothie blenders suggested by our experts. You don’t have to be an expert to buy the best blender ever. As a user, it depends on your need. The following list includes four most common queries, a user should be aware of. All motors come with power, but you should figure out the actual result. Does it really make smoothies that smooth? Can it crush ice like snow? We have noted that blender with a powerful motor above 900 watts works fine. It’s simple. The powerful and functional the motor is, the more impressive result it provides. Size does matter! A blender should fit under kitchen cabinets. Generally, a blender less than 17 inches tall fits well. It needs to notice the liquid capacity of a blender container. If it’s for family and friends, you should go for minimum 56 oz. (1.65 L) jar. But if it’s for single serve, go for one with a personal jar for smoothie. Why would you buy a particular model? It depends on what you expect from a blender. All blenders aren’t designed same. Some crush rock-hard ice to snow in seconds. Some are just basic smoothie makers. You should know the exact facilities to have if purchased. The right blender performs best, saves your money and time. Glass and plastic are two most common materials to manufacture blenders’ jar. Both have pros and cons equally. Some users find glass jar very appealing, as it remains shiny for a long time, and doesn’t absorb food stink. Glass jars are mostly thermal shock tested. By the way, they are breakable! We would suggest heavy duty BPA free plastic jar if you want powerful blending. Though, they keep food odor if not cleaned well. We’ve enlisted some most popular blenders; those have satisfied users with the impressive performance. Lets’ get familiar with a super blender that ensures easy nutrient absorption. The Breville boss cut ingredients into 50 percent smaller particles that traditional blenders can’t. Its powerful motor and high velocity ProKinetix blade together produces excellent quality mouthwatering smoothies. Variable speed dial with five one touch automatic functions including; smoothie, green smoothie, frozen dessert, soup and ice crushing let you have the perfect texture. For extra ease and more control, this advanced blender has a timer function with a back-lit LCD display. Its tight fighting lid has a ventilation feature to eject steam during blending hot soup, besides the Breville’s ring helps to open and close the lid. The BPA free blending jar is large enough to serve an entire family. This excellent smoothie maker has an automatic cleaning feature so that you can avoid injury while washing the blade and the jar. 1500 watt (2HP) powerful motor. 64 oz. (1.89L) Tritan plastic jar. Special lid with ventilation facility. Can blend both cold and hot ingredients. The Ninja Professional BL610 is one of the bestselling blenders, introduced by Shark Ninja. It’s a perfect smoothie maker, which comes with sleek design and outstanding performance. Powerful motor provides excellent execution in the kitchen, which assists your things done quickly. Ninja total crushing technology smashes ice, frozen fruits to snow in seconds; and makes delicious smoothies, shakes, sauces and purees. Its blending jar is large enough to serve the whole family. The material used in the jar is BPA free, that doesn’t harm health. All parts are dishwasher safe and easy to clean. This blender has unique design blades, what chops and mixes almost any fruits and vegetables. The most exclusive feature of this blender is the safety lid. Until the lid is secured for your safety, it keeps the blade from spinning. BPA free, dishwasher safe parts. XL 72 oz. (2.12 L) plastic jar. Great performance at reasonable price. Fits almost under any kitchen cabinet. With versatility and impressive performance, this blender is fun to use. It’s equipped with multiple gears, like food processing bowl and stainless steel slicing disk; which is very functional and help kitchen work. This blender features smart settings with three different speeds and three programs: Green/ Frozen smoothies, Food chop/ Salsa and Milkshakes. Powerful motor spins in dual direction, that keeps the blade from stuck and mixes ingredients well. Its extra-large blade ranges the whole bottom and chops any fruits and vegetables; crushes ice, frozen fruits and nuts. It produces delicious smoothies, shakes, purees, sauces and much more. The blending jar is made with Boroclass glass, that doesn’t absorb food odor. You’ll get a BPA free plastic made extra-large personal smoothie cup as well, to blend and enjoy right away. 1200 watts professional powerful motor. 3 speeds, 3 programmed settings. 6 cups Boroclass glass jar. 5 cups BPA free food processing bowl. Great for both family and personal use. Glass jar needs extra carefulness. Perhaps, can’t blend hot ingredients. The Nutribullet Rx is known as the world’s most powerful nutrient extractor. Its motor with high torque power base generates unimaginable power, what you even can’t expect. Using this force, it blends and grinds any substance you put into it; and makes perfect smoothies, purees, sauces, salsa and more. This machine is completely automatic. Its smart hands-free technology with auto ‘start and stop’ feature has made it super handy and has taken the guesswork out forever. Most blenders are designed for blending and juicing only, whereas Nutribullet Rx has a unique feature. Its 7 minutes heating cycle turns components, like vegetables into rich and healthy hot soup. The extractor blade chops any fruits and vegetables and crushes ice to snow in seconds. The blade tears every single fiver from ingredients and makes very smooth drinks. It comes with one blending pitcher and two different size smoothie cups with lids. As a bonus, you get a recipe book over 150 pages to experiment new healthy beverages. 1700 watts (2.3 HP) powerful motor. 45 oz. and 30 oz. smoothie cups. Able to make hot soup. This high powered, heavy-duty kitchen tool is more than a blender, which is ideal for everyday use. Using the Ninja total crushing technology, it slashes about any fruits and vegetables; and produces excellent smoothies, purees, sauces and so on. Stainless steel sharp blades pulverize ice, frozen fruits, and other hard substances; like seeds, nuts etc. in few seconds. It comes with one massive jar for multi-serve, and two small sizes Nutri Ninja cups with To – Go – Lids for single serve. Containers are made with BPA free, high-quality food grade plastic. You can use any dishwasher to clean the blending jar, cups and blades. The professional powerful motor provides three separate speeds, pulse and single serve function for particular blending. 1100 watts professional powerful motor. 3 different speeds, pulse, and a single serve function. XL 72 oz. (2.12 L) heavy duty plastic jar. Two 16 oz. Nutri Ninja cups with To-Go-Lids. Multi and single serve facilities. This high-speed blender is likely for lessening your daily kitchen hassle. Its professional grade motor spins the stainless steel blade over 250 MPH, and finishes task fast; what ordinary blenders can’t such good. A tamper is included to wipe difficult-to-process ingredients for smooth blending. No need to struggle with guesswork anymore. It let you blend with three programmed settings: Smoothies, Soup and Dips/ Spreads. Press the required button; and get delicious smoothies, sauces, shakes, hot soup and others. The BPA free Tritan jar is safe for health and large enough for multi-serve. Oster claims that it’s secure for crushing ice and grinding hard substances; like nuts, seeds and pureeing hot soup. You’ll get two beautiful color cookbooks as well. They’re Gourmet Cuisine and Fresh & Fit Recipes, written on nutrition and calorie fact. 1400 watts professional powerful motor. 64 oz. (1.89 L) BPA free Tritan jar. Stainless steel blade with high spin. Makes perfect smoothies and shakes. Single serve blenders are often underestimated for low performance. Nutri Ninja pro won’t disappoint you in this aspect. Professional power and Nutri-Ninja pro extractor blade work together and smash any ingredients. Thus, it crushes ice, frozen or whole fruits in seconds; and prepares delicious smoothies, shakes, cocktails, salsa and more. Auto shutdown feature saves the motor from overheat and burn. This small blender doesn’t have traditional Speed or On / Off buttons; rather it starts working after pressing down a smoothie cup against the base. It comes with two different sizes Nutri Ninja cups with sip and seal lead to take your drink anywhere. As a bonus, you get a guide including 75 healthy recipes. All parts are BPA free and cleanable with any dishwasher. 900 watt pro power motor. One speed operation with a pulse. Nutri Ninja pro extractor blade. 24 and 18 oz. Nutri Ninja cups. Cosori 1500 is a UL certified commercial grade blender which ensures users’ safety. You will enjoy hazard free operation, automatic overheat and overload protection. You can use this multi-role blender as food processor, ice crusher, coffee grinder and whole fruit juicer. The high-powered motor spins the razor sharp stainless blade 30000 RPM that generates heat and can produce warm soups within minutes. Besides, its variable speed and easy to use features assist you making smoothie, milkshake, ice cream, coffee, puree and more. Cosori offers a tamper to wipe out complex ingredients. It comes with two BPA free food grade plastic made blending jars in different sizes for family and personal use. Surprisingly, this high-end nutrient extractor is pretty cheap. Stainless steel blade with 30000 RPM. 64 oz. (1.89L) and 27 oz. (.79L) container with go to lead. Very powerful for crushing ice. 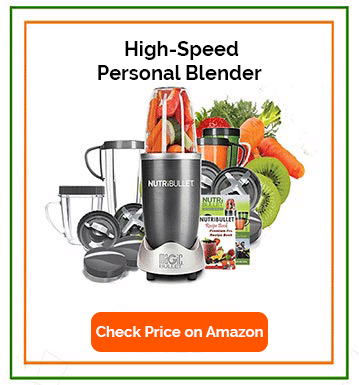 Ninja blenders are famous for power, and Nutri Ninja Duo BL642w is one of them. Power and intelligence combination finishes any kitchen task so fast. The Auto IQ technology knows what to do. Taking the guesswork out, it helps to find out the accurate time needed for blending. Five Auto IQ modes and three manual speeds have made it super handy. This frozen smoothie maker has a very powerful motor to take any blending challenge. Pro extractor blades pulverize ice, whole fruits, seeds etc. ; and produces delicious and healthy smoothies, shakes, purees, sauces and so on. It comes with one mega size jar with pouring spout for multi-serve, and three more separate sizes Nutri Ninja cups with sip and seal lids to take on the go. After every use, the dishwasher safe parts are secure and easy to clean. 1500 watts professional powerful motor. XL 72 oz. (2.12 L) blending jar with a lid and pour spout. Three Nutri Ninja cups – 18oz., 24 oz., 32 oz. with sip and seal lids. This is Ninja’s first Auto IQ standalone blender, which features both intelligence and power. Taking the guesswork out, its Auto IQ technology makes perfect fruit smoothies, which you don’t have to chew on anymore. Powerful motor provides professional performance and multi-functions; it separates the blending in three different settings: Smoothie, Frozen Drink, and Puree to assist quick outcome. Total crushing technology pulverizes ice and other ingredients in seconds. Unique designed blades crush about anything you put into it; which makes delicious smoothies, purees, shakes and others. It comes with a large plastic container, which helps you serving the whole family. The BPA free parts don’t harm your health. It’s made with dishwasher safe material, and cleanable with any kitchen soap. 12oo watts professional powerful motor. XL 72 oz. (2.12 L) BPA free blending jar. Probably can’t blend hot ingredients. Now, it’s time to reveal the name of the best smoothie maker for your kitchen! Still, this has no straight answer. The best one is what works best for you. A blender should be a daily kitchen mate. Every individual may have a personal brand preference. The truth is, every blender is unique with specific features. If you ask, most users would say; they’re satisfied with their own. There is no chance of exaggerating or underestimating one. 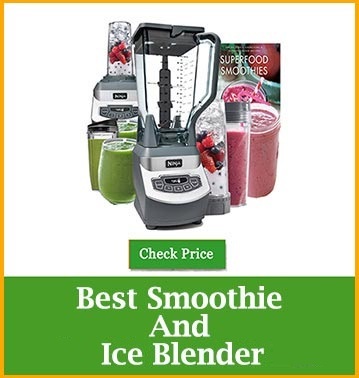 Finally, we would like to share our opinion about choosing the best smoothie blender. Are you a beginner? Go for basic blender, which has easy to use features. If you want a blender for single use, take a single serve smoothie maker to reduce blending hassle. If you need something versatile and expect professional performance, go straight to multi-function blender. However you appraise, all of them are awesome machines and going to assist you definitely.